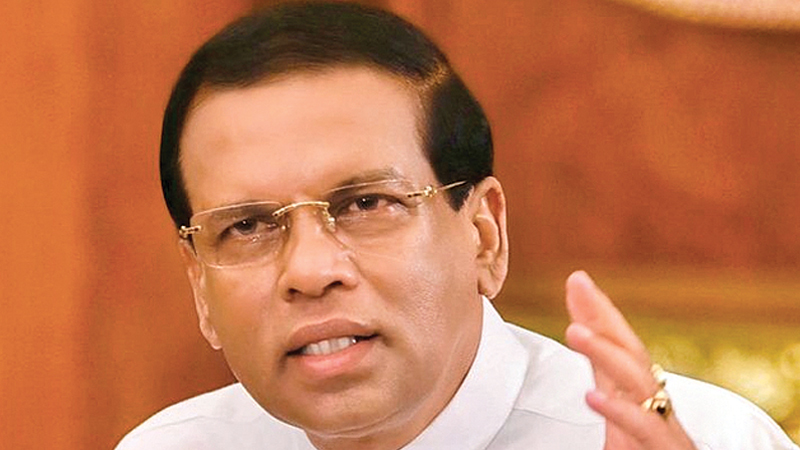 President Maithripala Sirisena yesterday stressed that he will put in place a mechanism to ensure that the development drive is free from corruption and irregularities, and will continue with high level of transparency. The President added that his policy against corruption and fraud remains unchanged. “I will create an atmosphere in which a development drive required by the people will continue without any hindrance with a high level of transparency and accuracy,” he said. The President was speaking at the opening of a new classroom complex at Girithale Primary School in Polonnaruwa yesterday. President Maithripala Sirisena was received by the students on his arrival at the school. The President presented certificates and awards to schoolchildren who secured the first place at the inter school music competition (Group singing category). The President also opened a classroom building complex at Yoda Ela Maha Vidyalaya, Hingurakgoda yesterday. The building complex has built at a cost of Rs. 11.45 million under the Pibidemu Wellassa programme with the assistance of the Sri Lanka Air Force. President Sirisena said the government plans to development 2,400 irrigation tanks in the Dry Zone. He said that over 120 irrigation tanks would be developed under this programme in the Polonnaruwa district. “The people in the district have been suffering from the scarcity of water for over six decades and we hope to permanently solve this issue by end of this year,” he said. North Central Province Chief Sanganayake Ven. Siriketha Siriseevali Thera and Polonnaruwa District Secretary Ranjith Ariyarathna were also present. He primed eradicate corruptions and punish rogues who robbed illions but so far nothin has happened. H.E focusing on irrigation tanks shows his concern for the people of the area. Similarly, education is what is valued so much by all, is promised transparency without corruption in the expected path. GMOA appeared to be honest helpers of SAITM which it earlier destroyed, towards a "recognized MBBS in KDU" so that govt. approved legal local SAITM medical students could complete their training to serve this nation. Now GMOA in league with SAITM owner is starting their own private medical TWIN CONCEPT which requires sending to Russia in a financial trading exchange. While GMOA/SLMC is struggling in Supreme Court to reverse judgment of internship, SAITM is not entitled to be part of any twin program which has to be between 2 recognized parties. When SAITM is recognized, there is no need to go to Russia. FCID needs to investigate this misleading of innocent students who are only registered locally. Outcry to abolish SAITM was to get the head of GMOA out of contempt of court case this week. Now this is an illegal private set up with job agents to send some SAITM to Russia, an already failed venture 10 years ago. H.E please see that all SAITM students receive justice and are sent to one place KDU to complete as they are registered locally and are not going to Russia on illegal course. Parents need to be warned about the trap laid for them. Sanity must prevail in the midst of terrorizing pressure as H.E has executive powers to save innocent students. President in his wisdom used his executive powers to give transitional justice to the injustice forced on the SAITM medical students who fully paid up fees to complete govt. approved medical course. They are being affiliated to the approved KDU as a one time Class Action till all complete their studies, so that the accusations and opposition to private medical education in SL with profit will come to a halt, and that GMOA need not strike anymore killing patients. Dr. NF needs to be aware of his financial responsibility and accountability to students whom he gave promises to as they paid the stipulated fees on a legal profit basis. Protection of the law is needed so much in this isle of scams & robberies. How can you eliminate corruption by protecting SLFP former parliamentarians who blatantly were caught taking commissions and bribes. There is nothing to honour you or anyone of your colleagues, who became rich thanks to commissions. Mr President what the people want Action not promises.Politicians can't solve the countrys problems- they always think short termThe country should be run by a Council of Professionals reporting to you.And you should offer them a corruption free environment Who can do that? From the days of Minister of Health this cynical Sirisena have continued his sarcasm and cynicism. One of the above comments refers to as H.E. Cynical sirisena himself have requested not to Honour him as he knows the politicians in Sri Lanka are worthless worms. So Why this man Honours him is mindboggling. Both the leaders are psedo-philosophers who come up with conceptual views while they present talks to forums on variuos subjects. This is a corrupt governnment led by mafiaso who in fact are in the parliament itself. This is a mafia regime with full of environmental terrorists, including leading businessmen in Sri Lanka, who in fact should be eliminated.